Some countries are born out of revolutions and acts of violence, not Canada though, our great country was built in a very Canadian fashion, through ‘a series of conferences and orderly negotiations’. The confederation that took place on July 1, 1867, unified the British North American colonies of New Brunswick, Nova Scotia and the Province of Canada and was the first step in a nation being built to fulfill the dream of a country. Throughout the last 150 years, each province that we know today joined the Dominion of Canada at various stages, with Nunavut being the last member to join in 1999. 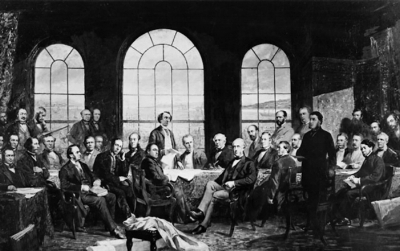 The Fathers of Confederation. The original painting was destroyed in the Centre Block fire of 1916. This past weekend, and every year on July 1st, we celebrate Canada Day, a day synonymous with celebration and pride. Canadians from coast to coast to coast wear all the red and white they can find, and proudly hang the Canadian flag to honour this great country we’re lucky enough to call home. This year was especially monumental as it celebrated the 150th anniversary of the birth of Canada, and as we build our miniature Canada, we can only hope to be around till we’re 150! Canada as it was in 1867 when the British North American colonies of New Brunswick, Nova Scotia and the Province of Canada united.